The last three weeks has had quite an effect on ELO's projected end of season ladder, as you can see in the table below. The top 3 positions are unchanged, firmly held by the Cats, Saints and Dogs, but there's significant movement amongst the next 8. Carlton moves from the fringes of the top 8 into 4th, dethroning the Pies who drop to 6th. The Lions and Sydney - both now projected to win two more games than thought previously - move into the top 8 at the expense of the two Adelaide teams, who both now miss out on a finals spot based on (my proxy of) percentages. Making the final 8 now requires 11 wins, which is more in keeping with seasons past than the 10 wins that were projected previously. Also, the teams that make up the projected final 8 are the same teams that currently occupy the top 8 teams on the competition ladder. Positions 11 through 16 are all held by the same teams as in the earlier projections, albeit that there's been some interesting but inconsequential rearrangements. 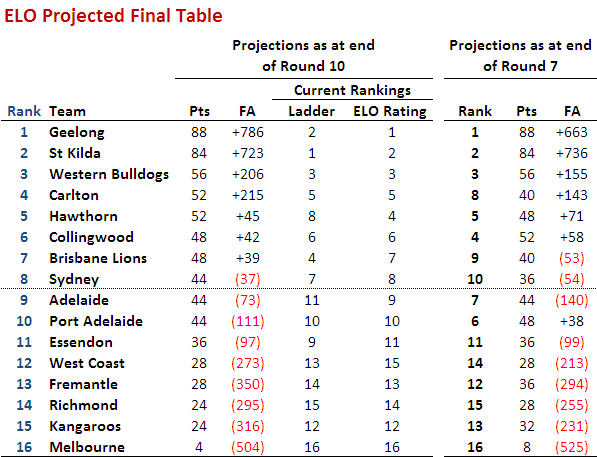 Unrearranged though is Melbourne, now projected to lose all of its remaining games.